Claim 25/1 Man UTD to beat Stoke City at Ladbrokes + money back! Manchester UTD visit Stoke City on Saturday's late kick-off in Premier League and Ladbrokes are offering ahuge enhancement on the match! This article shows you how to claim 25/1 for Manchester UTD to beat Stoke, plus money back if you lose! Manchester United are the only team wit a 100% winning record after 3 Premier League matches and the Red Devils are expected to extend their perfect start on Saturday! Are you backing Manchester UTD to beat the Potters? Put your teeth on this great price boost - 25/1 Manchester UTD to win the match!! Join Ladbrokes via our special links and get 25/1 for Manchester UTD to beat Stoke City! 3) Place a single bet of up to €/£1 on Manchester UTD to beat Stoke City in the 'Match Winner' market before the kick off. 1. 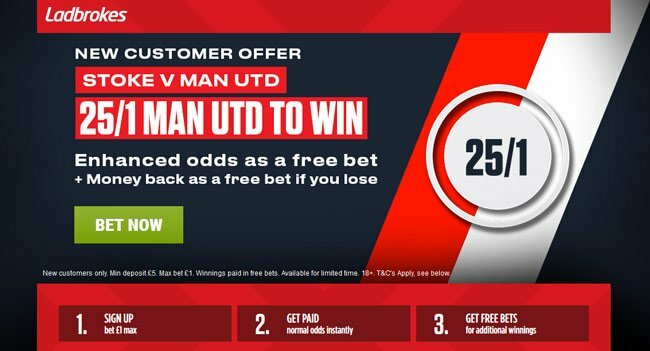 Offer available to new Ladbrokes Online & Mobile customers: Simply register today, deposit a minimum of £/€5, and place your first bet as a single bet of £/€1 on Man United to beat Stoke (25/1). 2. This offer is available for a limited time only. "Claim 25/1 Man UTD to beat Stoke City at Ladbrokes + money back!"